It’s a relatively simple task to deploy an application like SharePoint within your organisation: the challenge comes in getting people to use it in a way that is consistent and productive. Studies have shown that whilst SharePoint is widely used within organisations at a departmental or work group level for file sharing, deployments where SharePoint usage becomes “enterprise standard” and where a wide range of the functionality is used in relation to core business processes, are far fewer. How much value does SharePoint really add if it is simply used as a local file-share, and why is its full functionality not more widely used at an organizational level? Our free white paper addresses some of these issues and should be a valuable resource for anyone planning a SharePoint implementation. which we had posed in a number of on-line SharePoint groups and forums. The people who answered our question ranged from SharePoint consultants, trainers, system administrators and system architects to power suers and end users. 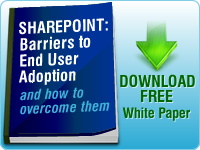 Their combined responses offered a wealth of insight into the barriers to end user adoption of SharePoint and how to overcome them. They covered business alignment, roles and responsibilities, knowledge and understanding and user engagement, amongst other things- essential reading for anyone who is about to deploy SharePoint. We found the discussion really interesting and we think it offers some useful lessons. What are your thoughts and what have been your own experiences of SharePoint implementation and user adoption?